We saw Olaf's Frozen Adventure in the theaters before Disney•Pixar's Coco. The girls and I fell in love with the story! I loved seeing all of Arendelle share their family traditions and the beautiful decor in the town. I instantly fell in love with the wreath that they had hanging in the palace, all around town on lamp posts and the villager's doors. So I decided to make an Arendelle wreath for my own home! 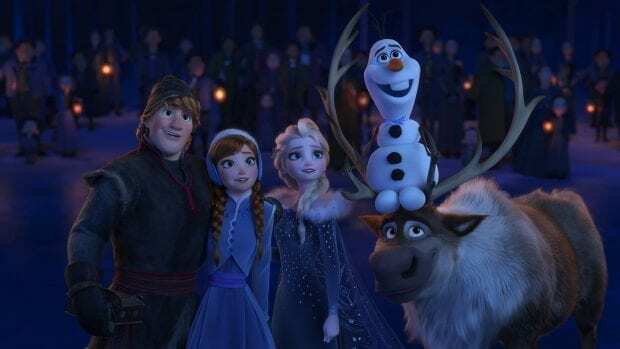 The featurette includes four new original songs and welcomes back the beloved characters (and cast) who won over audiences worldwide in the 2013 Oscar®-winning feature, “Frozen,” the top-grossing animated film of all time. See the wreaths on the door? 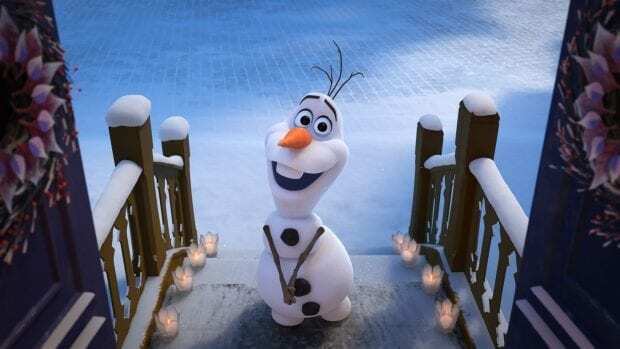 Olaf's Frozen Adventure will be available for Digital download on December 19TH! Enter to win a copy below. Give me all the Disney Frozen Short films; we love them. I'm so glad that it is coming to TV so we can watch it again for Christmas! 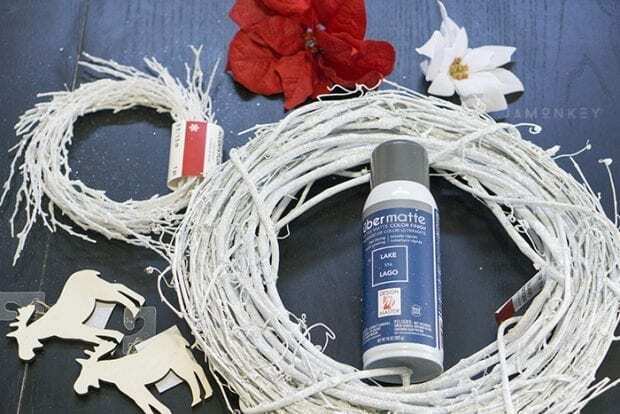 This project took a lot of supplies but get them during Christmas because white wreaths and poinsettias are hard to come by the rest of the year. I bought everything at Michael's or the Dollar Tree. 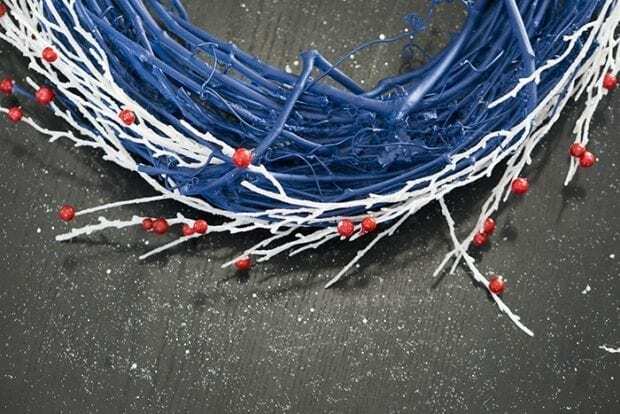 White Wreath – This wreath is white on one side and silver glitter on the other. 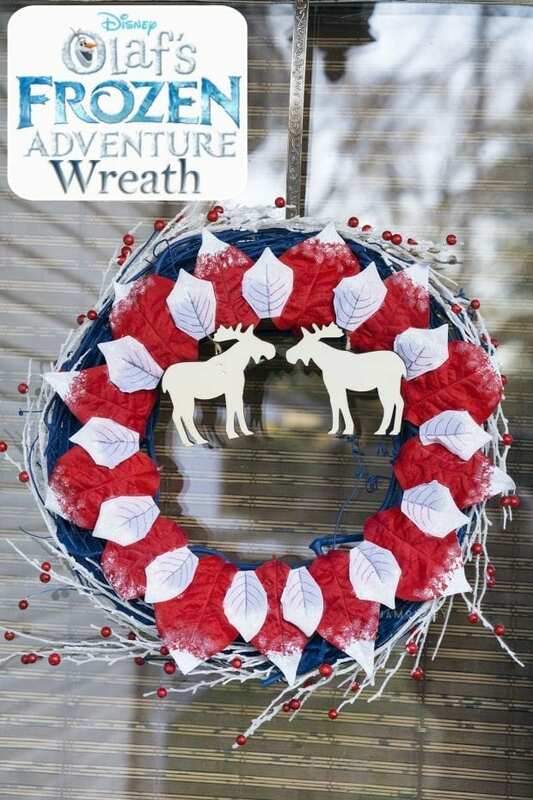 I bought this wreath so that I can make it reversible in case I didn't like the blue color. 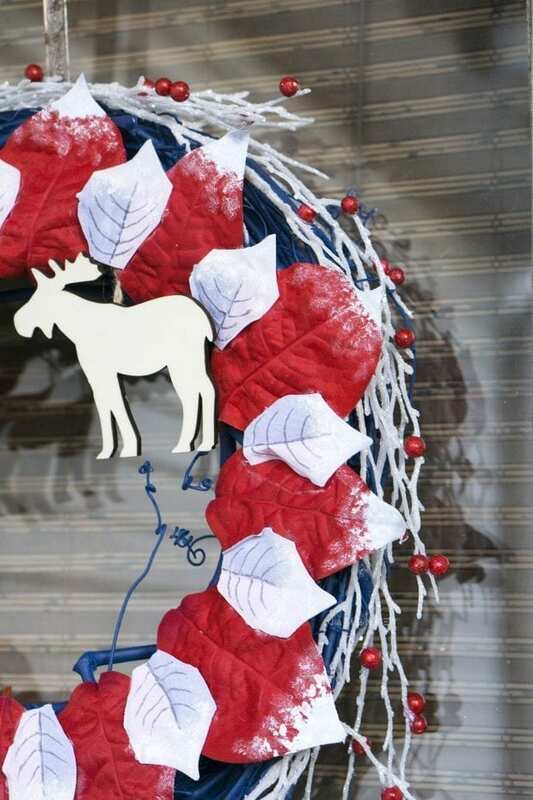 Moose 2X – In the movie there are little wooden rams that hang on some of the wreaths. I couldn't find a ram and went with a moose instead because he looked like Sven! 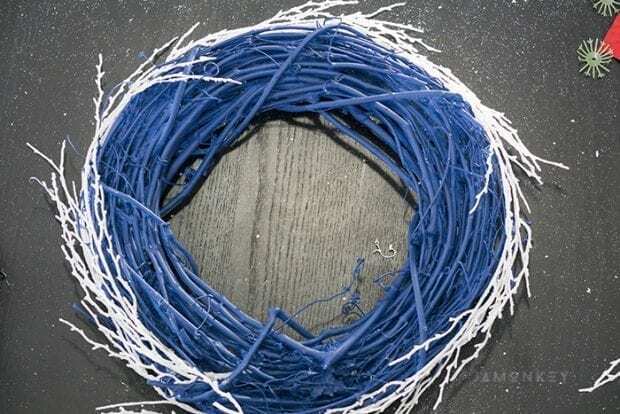 The first thing I needed to do was paint the wreath blue . I only painted one side of this wreath because I wanted to make it reversible with the silver glitter side still intact. 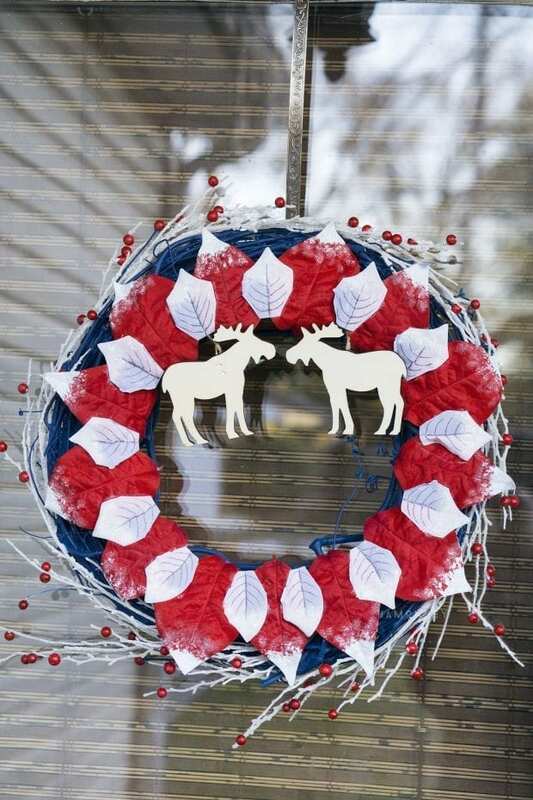 Both sides look amazing, and the way I built the wreath makes it easy to place the flowers and moose on whichever side you prefer. For that reason, you'll have two steps for this project the wreath and the flower wreath. After the wreath was dry, I wrapped the twig garland around the outer edge of the wreath, so the twigs were hanging off. I couldn't find a plain twig wreath that really looked like the one from the short film, so this is how I many my own. Hot glue the twig garland in some strong point around the wreath. 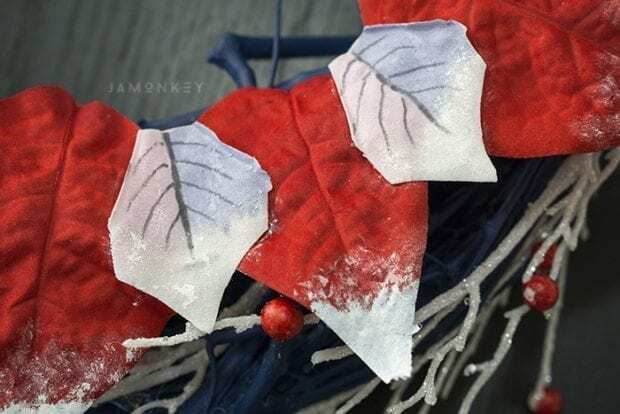 Then, I carefully removed the red berries (light foam painted red) and glued them to the twig garland around the outside. 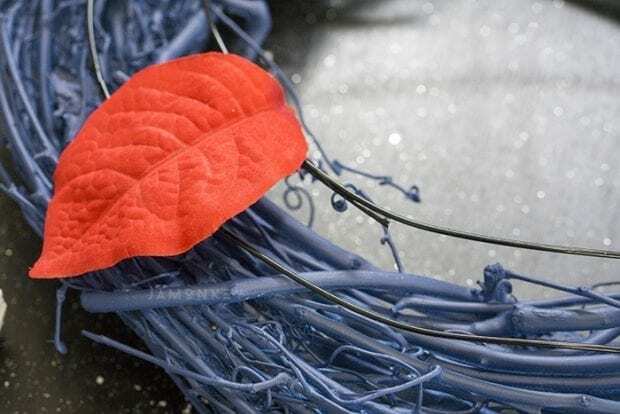 For the next part of the project, I started working on the poinsettias that line the wreath. I cut the largest petals from the flower and set them inside a book to straighten them out the best I could. 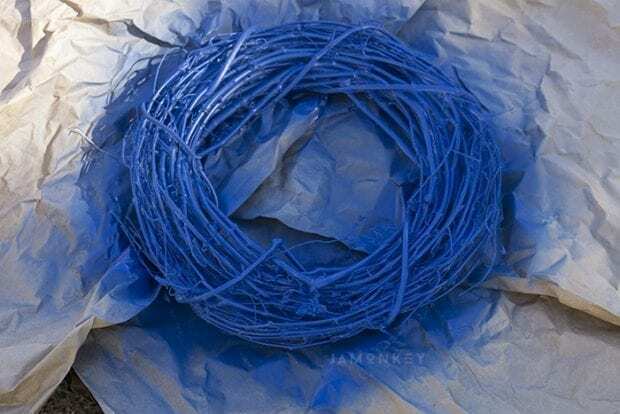 I used thick floral wire to create two rings for the poinsettias to rest on separate from the twig wreath. One ring is about 1 – 1 1/2 inches smaller than the first ring. 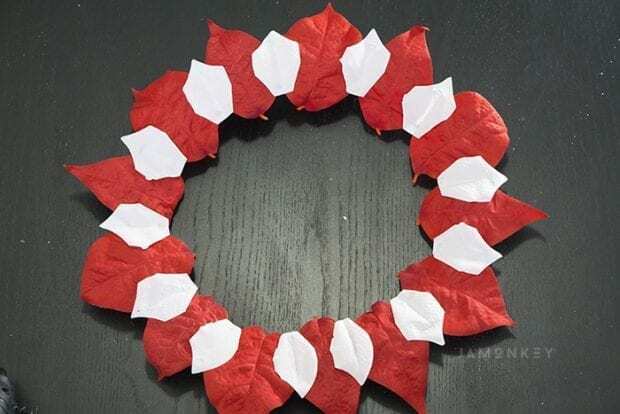 I hot glued all of the red leaves onto the two rings to create a stable poinsettia ring. I then glued the smaller white petals between each of the red petals. Now it's time to paint! The white flowers have a powder blue (white and blue) side and a light pinkish-purple (white and purple). They also have “snow” on the tips. I then drew the veins with a grey sharpie. The red petals have snow on the tips. I'm not going to lie; this was the most time-consuming part because fake poinsettias have a velvety texture that makes them hard to paint. After everything was completed, it was time to assemble everything together. One of the moose had to be altered so that they weren't both facing the same direction. I just pulled out the staples and put the cord on the opposite side. 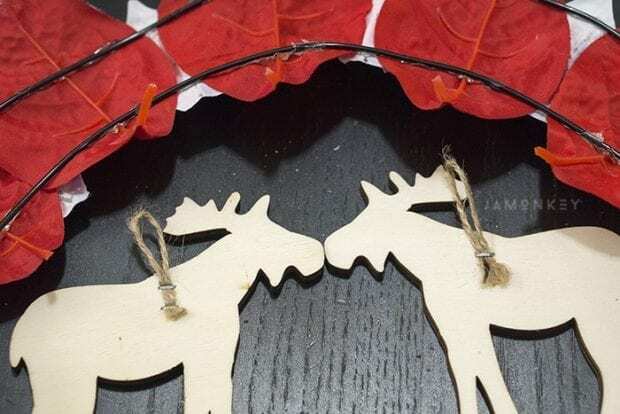 I have used floral wire to hang the moose from the poinsettia ring. I then used floral wire to attach the poinsettia ring onto to twig wreath. I'm kind of in love with how adorable it is! Olaf is our favorite character. We like Olaf the best. My favorite Cars character is Ramone. Rusty is our favorite Cars character, and my little girl likes everybody from Frozen. We like Lightning McQueen but love Olaf form Frozen. My childs favorite Cars character is Lightning McQueen. Thanks for the giveaway. I hope that I win.